Rarely do we hear about the positive side of the service industry. More often than not, when it’s posted on Facebook, we hear in excruciating detail how a customer stiffed their server or how a server dissed their customer. But here’s one kind gesture that just may leave you feeling like there are still some good people in the world. 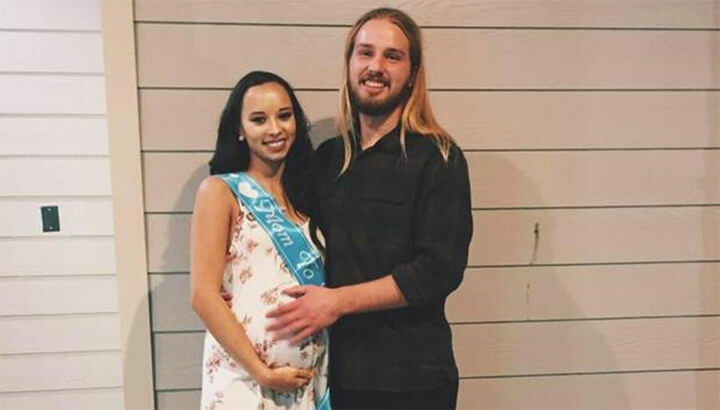 Born in Ireland, 22-year-old Ben Millar was working in an American restaurant in Houston, Texas. He had been planning on a trip home to Ireland once his son was born and decided to share his story with a customer. The man told Ben that he had just visited Ireland. Jokingly, Millar said, “Wow, I wish I could go back there for a weekend and visit my family.” He thought nothing more of it. 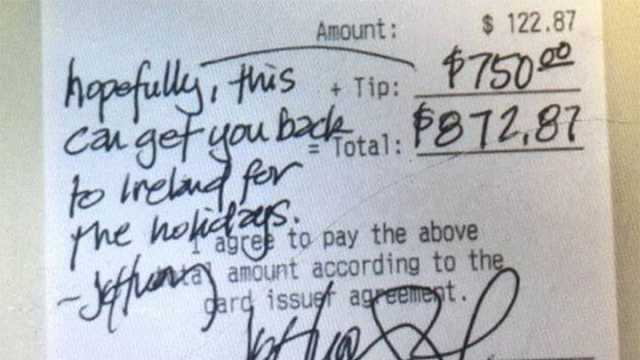 Then, when he went to collect the bill, Millar was shocked to discover that the customer had left him a $750 tip, along with a handwritten note. It read, “Hopefully, this can get you back to Ireland for the holidays,” wrote the customer, known only as Jeffery. Apparently, Jeffery left so fast that Ben never had an opportunity to thank him personally for his kind-hearted gesture. By sharing his story, Ben hopes that Jeffrey will see how much his generosity meant to him and his family. Maybe you’re not in a position to give such an extravagant gift to a complete stranger, but there are other ways to give — and they cost very little. When I looked ahead, the man was gone. One kind act by a total stranger changed my entire day and outlook. I suddenly felt hopeful, positive and happier. But what did it do for him? Well, as it turns out, research from Harvard shows that happiness can be found by spending money on others. The study, which included 632 American men and women, showed that those who gave more to others in what the team labeled as “pro-social spending” had a greater level of happiness. Interestingly, how much they spent on themselves had no impact on happiness whatsoever. In another experiment, researchers handed envelopes of money to UBC students on campus. They were told to either spend the money on themselves or on others. What researchers found was that people who spent the money on themselves weren’t happier, by that same evening. But those who spent it on others were. The amount of money, which was between $5 or $20, didn’t matter. It was how they spent it that made them happier. So, if you really want to be happy, stop filling your home with material goods that you really don’t need. Instead, be more generous and selfless. If your financial needs are met, give to people in need. And if you can’t give money, volunteer your time to a worthy cause. At the very least, just be kinder to everyone around you. Believe me, they’ll pay it forward and the world will be a happier place — thanks to you. Previous articleWould You Help Someone You Love Die? Hey Buddy!, I found this information for you: "Server Gets 0 Tip So He Can Do This". Here is the website link: https://www.thealternativedaily.com/server-gets-huge-tip-to-fly-home/. Thank you.